I am woefully behind on my postings. The days are so full and tiring. I sit down at night to write and can barely keep my eyes open. I have also just realized that we haven’t taken a single picture of either of us in days. We’ll try to do better. We thoroughly enjoyed the Main River, even with the persistent head-winds. Not every kilometer of it was picture perfect, but the whole package was wonderful. 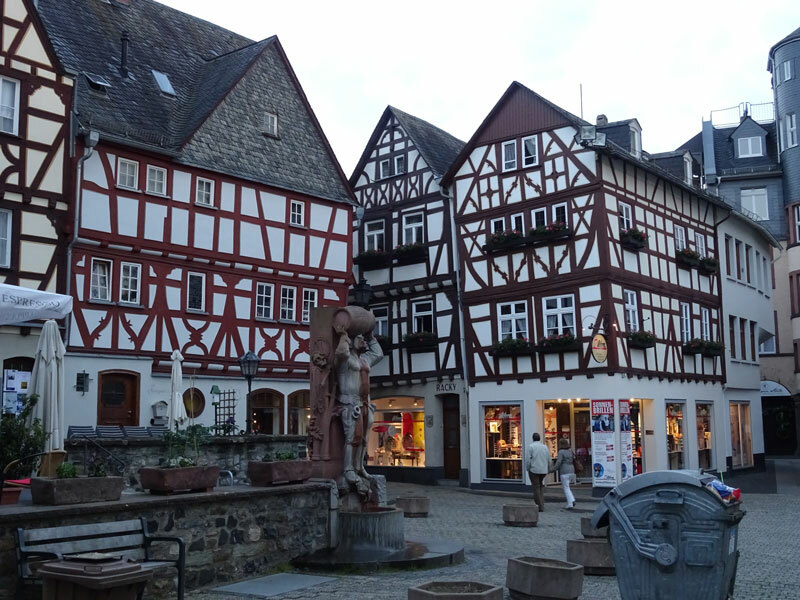 We went through some lovely little towns; Lohr and Wertheim, in particular, stand out. Despite our leisurely pace and easy days, we made it back to Frankfurt, with nine days to spare before Jeff’s chemo in Essen. 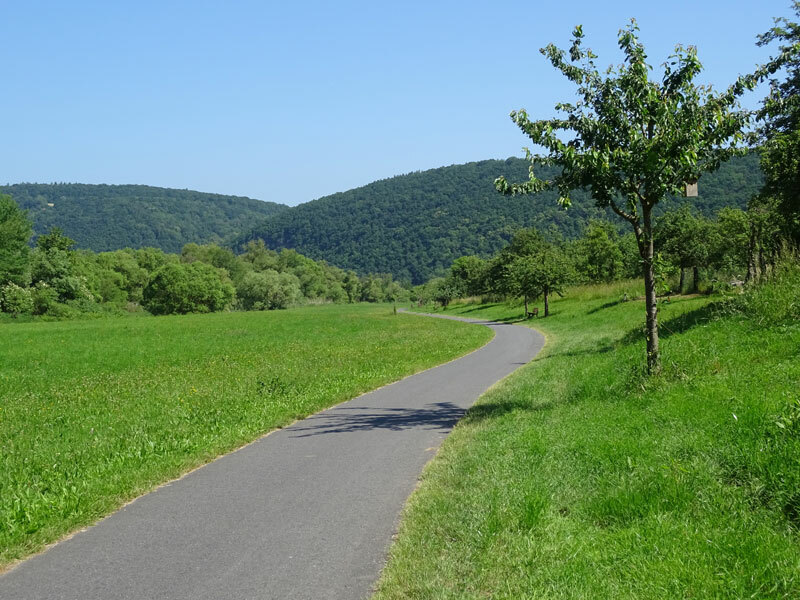 We need to stay close to Essen, so decided to follow the road less traveled, the Lahn River route. And this time we’re going with the wind! It’s tough getting the timing right when planning bike travel. Weather, terrain, mechanical failures, conditioning, illness … or just a change of mind … can throw a curve ball into any plan. 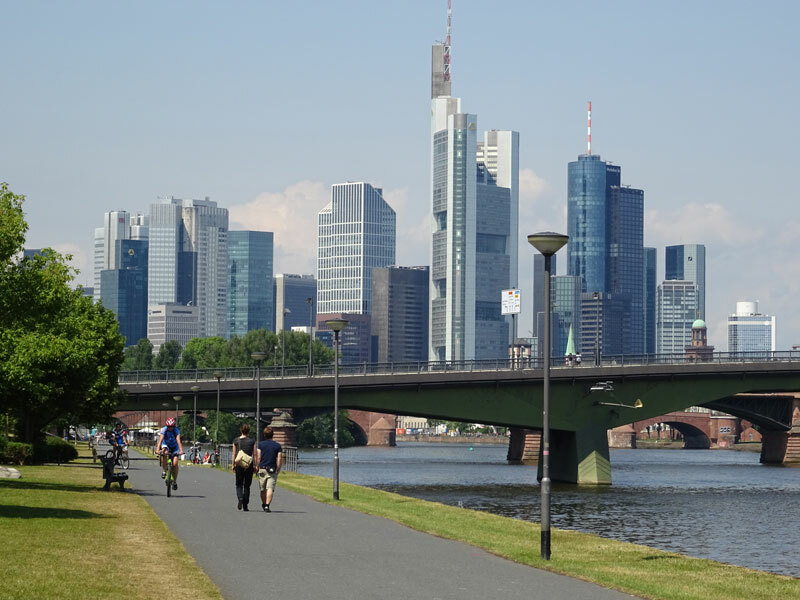 The Main cycle path took us right into Frankfurt, which was less stressful than I had been anticipating. From Frankfurt we took a train to Marburg, our starting point for the Lahn route. Now Marburg, that is one cute city. 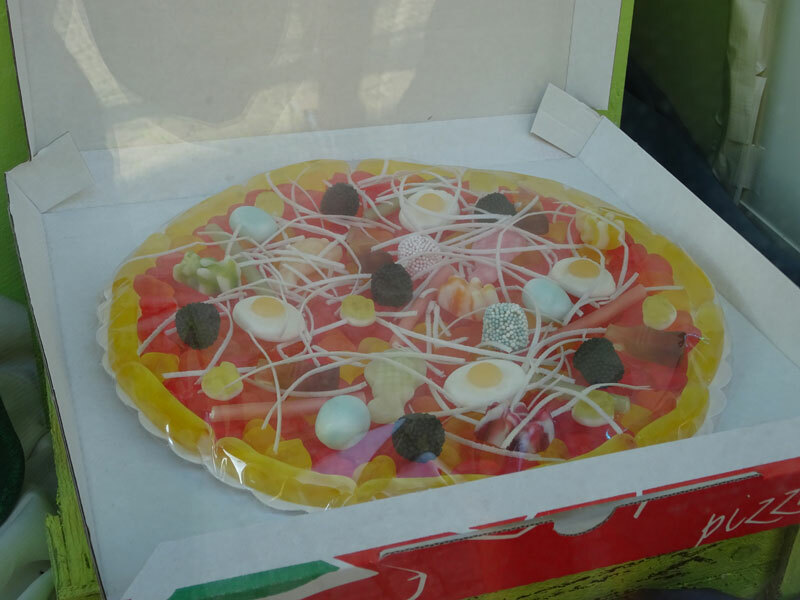 They even have a Gummy store … everything gummy, from bears, to pizzas. I kid you not. It’s a lively college town, with a great medieval section, perched on the top of a hill. We stayed in a hotel below the old town, right across from a public elevator that went up many, many stories before opening out into the old town. Very cool. The bike path entering Frankfurt. 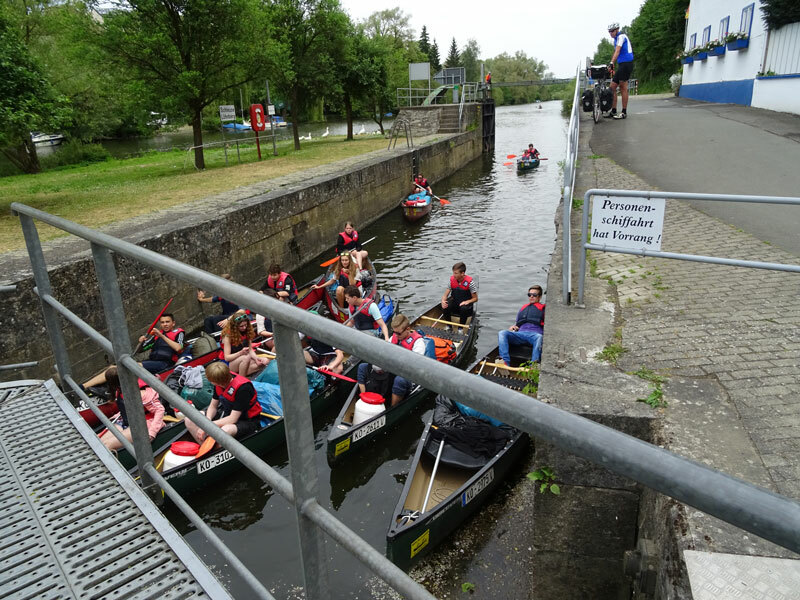 A group of canoeists entering a manually operated lock. 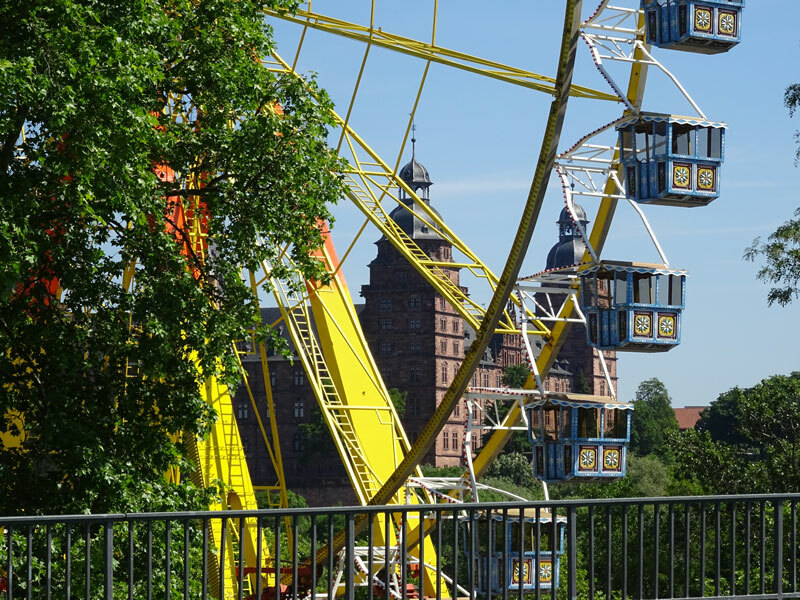 We thought the Lahn would take us four days to ride, but we’ve pretty much finished it in three. The Lahn was interesting. Pretty terrain, more hills (which translated into more climbing on the route), and much less touristed than the other routes we’ve done. 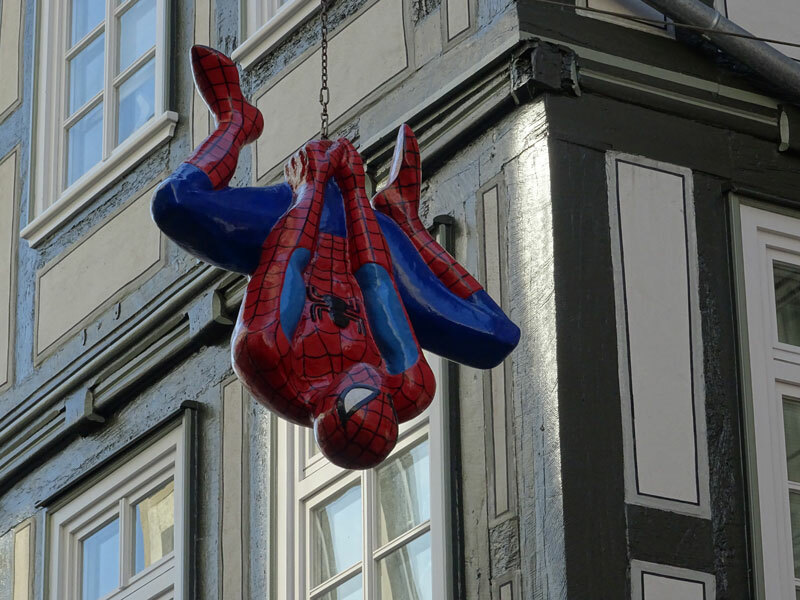 In fact, Marburg was the only town mentioned in our Lonely Planet guide. We spent a night in Limburg, a pretty town with a lovely old cathedral that had been bombed in 1945 and substantially restored. It’s becoming a familiar sight in churches and various tourist attractions: A section with pictures showing the building pre WWII, then in rubble after being bombed. Some of the less fortunate cities we go through have almost no medieval buildings standing. Some half timber houses in Limburg. It’s not an optical illusion. The house is, indeed, listing to the left. I’m in Bad Ems this morning as I write this. It’s one of those old bath (bad) towns, with tired old grand buildings from a bygone era when its natural thermal bath healing spas were popular. We’ve seen this kind of towns for years. As soon as I hear Bad in a town’s name, I expect a place just like this. I like them. 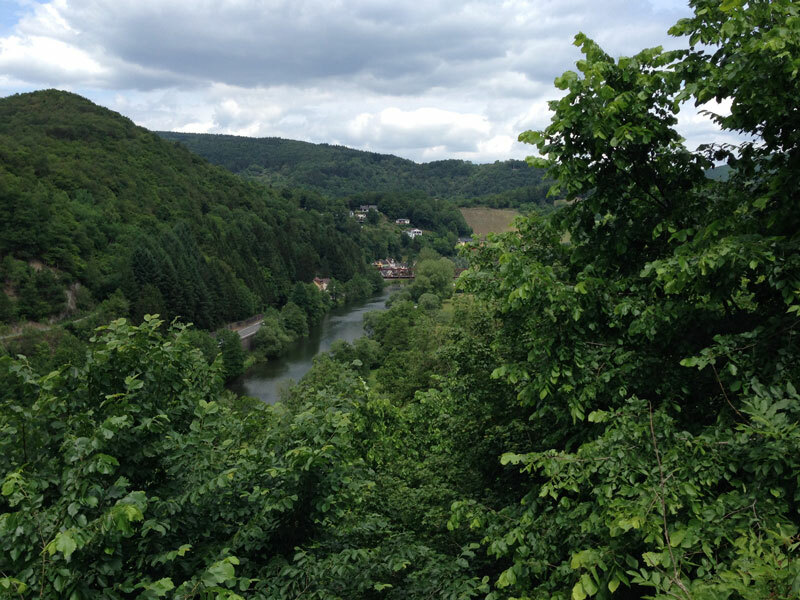 View from an Abbey on the way to Bad Ems. The climb up had a 16% grade! 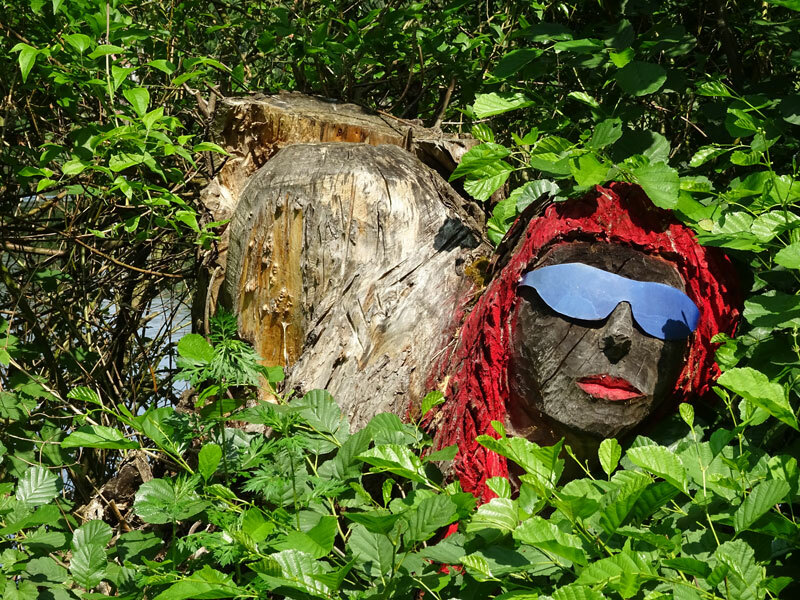 While riding the bike paths, we find that we keep seeing the same cyclists over and over. It’s a bit of a “tortoise and the hare” scenario. We’re pretty fast, particularly on flat terrain. Tandems are made for the flatlands. But we stop a lot. A whole lot. We’ll often pass the same group half a dozen times in a day. After a while, we almost feel like friends. We wave at each other, and sometimes get to talking. It’s great fun. It’s amazing who you see on a bike here. All ages and shapes, some on e-bikes, some carting around their dogs in baskets or trailers, little children riding amazingly long distances. I just marvel at it. Everybody likes to bike tour, even dogs! We still have six days before we need to be in Essen. After much deliberation, we’ve decided to continue north on the Rhine, starting in Koblenz, where we left it for the Moselle. 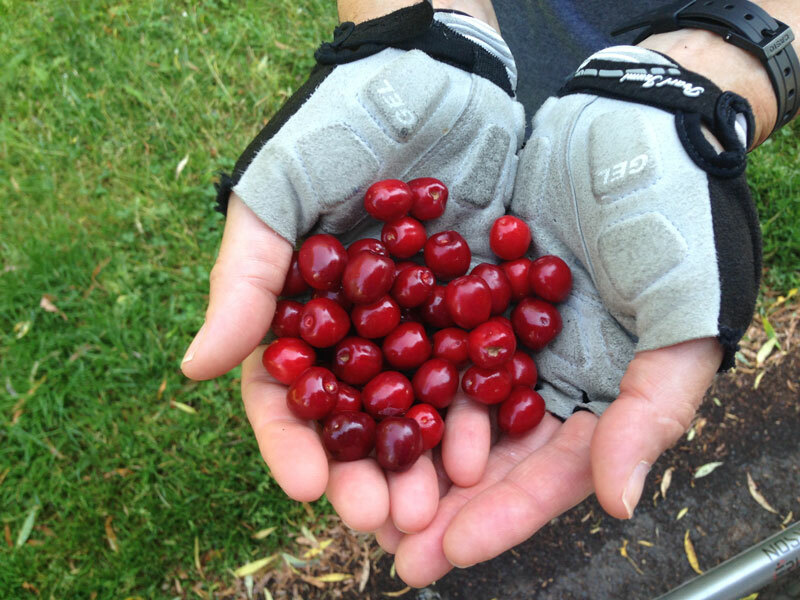 If it’s too congested, we’ll come up with a plan B.
Cherries! I always stop to pick ripe fruit! These last two pictures are for a special little boy, Seth, who is convinced that Jeff is Spiderman! We spotted them many miles apart; who knows why. Had been missing your posts for a few days and hoped all was well. What a fabulous adventure you all are having! Feel like i’m on the trip with you without the extreme effort! 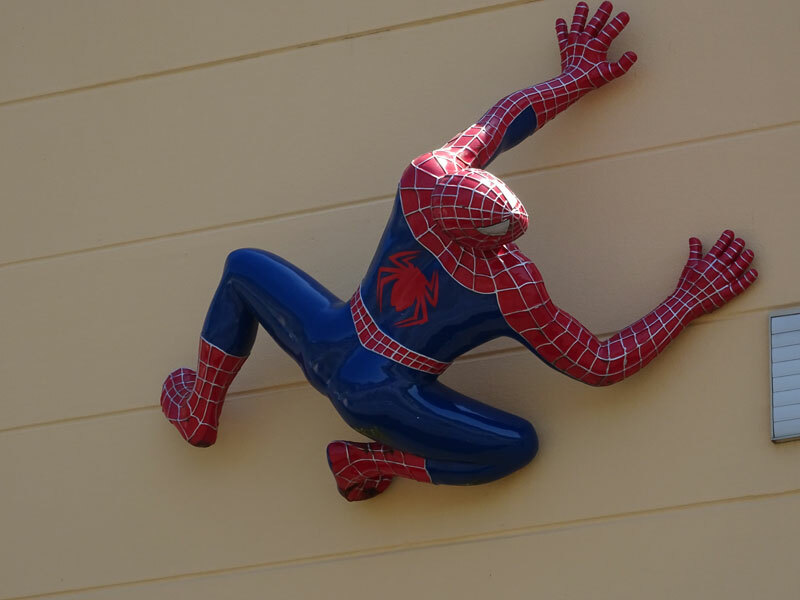 🙂 Great Spiderman pictures! Love your blog! You are quite the blogger!!! I agree with Marian, so enjoying the adventure in my comfy chair!! Be safe! You guys are having the time of your life and an inspiration to us all. I keep thinking about getting a bike and then I remember the one time I tried to ride a few blocks uphill to a gas station for air and how I was huffing and puffing, but Its still on my things to do at least for the exercise. I am so proud of the you both, especially Jeff an I tell his story to friends that are also fighting a tough battle with cancer, it gives them hope. Lissa & Jeff you both have shared and touched many lives.. God Bless you both and Keep On Keepin’ On! Great photos!! Looks like you guys are still having a grand adventure! It’s nice, too, to be reminded of the chemo adventure. I hope that all goes as well as can be expected. You sound very relaxed, and that is nice to hear in your voice. Can’t wait to see you both and hear all about the adventures. I have been out of town for a couple of weeks, so haven’t seen anyone for a while, but will be at Black Mountain on Friday for a meetup, so will say hi from you. 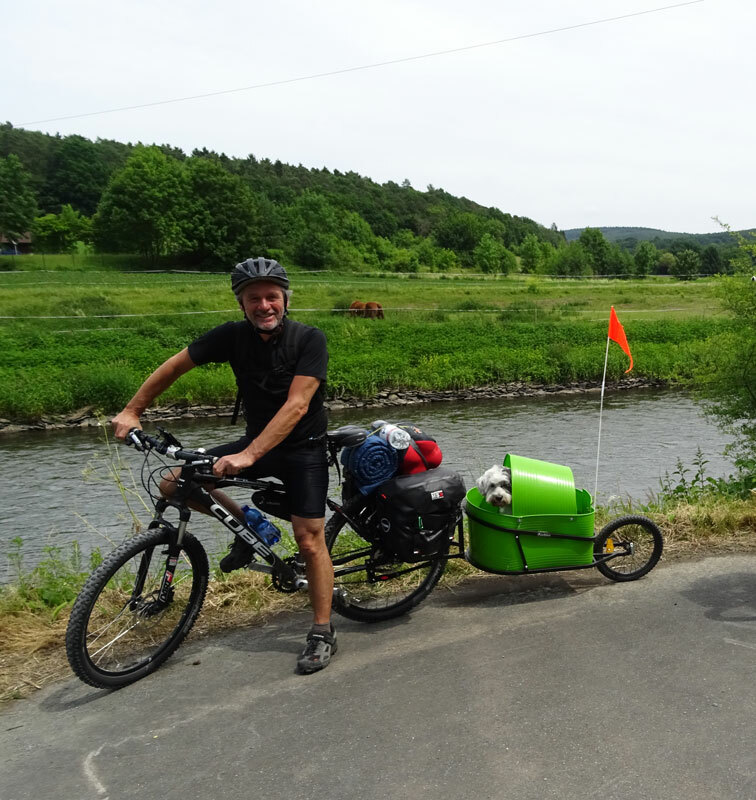 We really enjoyed meeting you at Kloster Arnstein on the Lahn and learning a bit about your unusual trip through Germany. Of course we were anxious to read more about your adventures and as soon as we got back home from our camping trip and hat internet access again we checked out your blog – very delightful reading indeed. Ever since we met you our thoughts are with you a lot and from now on we will certainly not miss any of your posts. We admire what you are doing and wish you all the best for your further endeavors, especially Jeffs upcoming chemo in Essen. Monika and Otmar with Silma (the Dalmatian) and Lea (the Goldie on wheels). It was a pleasure meeting you as well. Give those pooches a pet for us! Lissa, Robin shared your email and link to your blog. i am devastated by the news of Jeff’s diagnosis. The trip and blog, however, are a joy. I am now a “follower”. Safe travels and know that you have another friend with you on your journey. You are an amazing writer and person. I don’t know if you know of my son, Jake’s, passing in January 2014. I am more than a bit familiar with changes in priorities brought on by a crisis such as the one you are dealing with. Hugs and love to you both. I am stunned and saddened to hear about Jake. The loss of people we love is always painful, but so much more so when it’s out of order. Please know that my heart is with you.